This charming pedestrian footbridge was built by volunteers to commemorate Cottage Grove&apos;s 100th birthday, a historic town known as the "Covered Bridge Capital of the West." 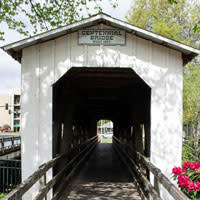 The bridge connects Cottage Grove&apos;s historic downtown district with the Applegate Trail Interpretive Center and a Veterans Memorial. It is an excellent starting point for a self-guided tour of the town&apos;s six bridges. To build Centennial Bridge, residents raised money selling personalized bricks and held several fundraising events including a train ride and a barbecue. 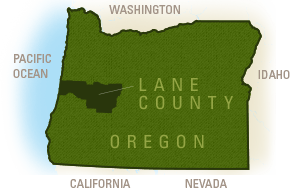 They salvaged timber from two historic Lane County covered bridges, the Meadow Bridge and the Brumbaugh Bridge, which had been dismantled in 1979. The new bridge was build where Cottage Grove&apos;s historic Main Street Bridge had stood until the 50s. This picture perfect footbridge is a 3/8 scale model of the famous Chambers Railroad Covered Bridge located nearby. It is only 10 feet (3 m) wide and 14 feet (4.3 m) tall with many windows along both sides. A time capsule featuring 80s mementos is encapsulated in the entrance. Buster&apos;s Main Street Café is in the former hotel where Buster Keaton stayed while filming "The General"
The perfect starting point for a tour of Cottage Grove bridges! The Centennial pedestrian bridge was built in 1987 with recycled timbers that were salvaged from other dismantled historic bridges. Adjacent to the bridge, in the City Hall building, a scale model of the Currin Bridge, shown at the 1986 World's Fair in Vancouver, B.C., is on display. The footbridge crosses the Coast Fork of Willamette River with an 84 feet (26 m) span. DIRECTIONS: Located in downtown Cottage Grove at the corner of Main St and River Rd.